BioWare is calling the audition, Galactic Guild Battles. Guilds will need to have their top level 55 PVP players participate on the Public Test Server. Players can utilize the Character Copy feature, so the current in-game PVP character will be on the PTS. Once your guild’s PVP Arena team is on the PTS and ready to do battle, BioWare has outlined the steps the guild teams need to follow to qualify for the chance to be part of the livestream events. 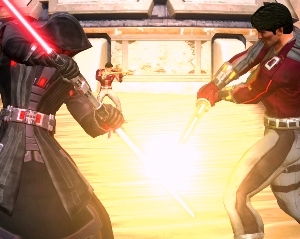 All participants must have a valid Star Wars: The Old Republic account, opted in for Star Wars: The Old Republic email communication, be in good standing (not in a banned status), and have systems that meet the minimum hardware specifications. The primary streamer must have experience with streaming in HD on Twitch.tv using XSplit streaming software. If selected, all featured players will need to download the free Skype voice communication application to their PC and also have access to a webcam and headset for use during the livestream. European servers: Thursdays or Fridays between 11AM PDT – 12PM PDT / 6PM GMT – 7PM GMT. Coordinate a premade 4-player Level 55 group from your guild and queue for Ranked Warzone Arenas on the Public Test Server. -The driver of the camera should have a central role in the fight and must be the same player who will drive the camera in the live stream. 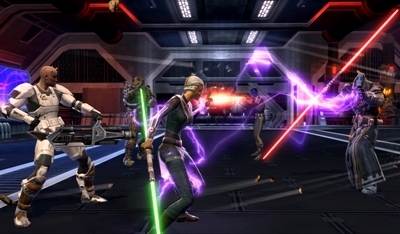 -Gameplay and game audio must be from Star Wars: The Old Republic and no other source. -Keep the HUD/UI ON when filming. -Do not include any slates, callouts, legal lines, rating logos, or company logos. -Do not include gameplay behaviors or in-game chat that conflicts with Star Wars: The Old Republic’s Terms of Service. We will contact you via email with further instructions on uploading your video submission. If your guild is selected, we will coordinate with you to determine a specific date/time for your guild’s livestream. If we reach out to your guild and do not hear back within three days or are unable to coordinate a mutually convenient time, we cannot guarantee your guild’s participation in the livestream. Unfortunately, we will not be able to respond to every submission. 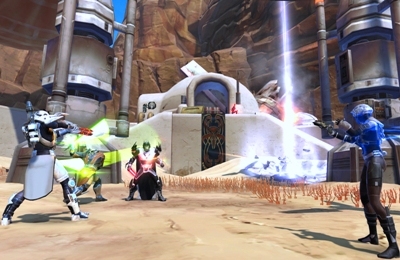 Here is a chance to showcase your guild’s PVP talent on the Public Test Server in the Warzone Arenas. Logon to the PST, assemble your guild Arena team, queue up for an arena, record the fight in high-quality video, and submit the video before September 8th!